Today I will give some basic information about our research and the expedition. Throughout I am aiming to keep my texts here as low-tech and math free as possible. Just before Christmas the Korean research vessel icebreaker Araon will depart from Christchurch in New Zealand heading towards the Amundsen Sea. 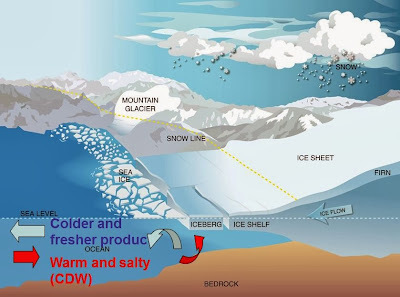 Our main interest is the shelf area, the transitional zone between the deep ocean and the coastal zone. The shelf is around 500 meters deep and there are several deep canyons intersecting it. The Araon is 110 meters long, holds 25 crew and 60 researchers and is capable of breaking 1 meter thick ice at a speed of 3 knots. Joining me on this trip will be my supervisor Anna Wåhlin and technician Johan Rolandsson from Göteborg together with our collaborators from Korea Polar Research Institute, Ho Kyung Ha, Sang Hoon Lee and Tae Wan Kim among others. Basically we will do measurements of salinity, temperature and currents in the ocean. These will be carried out from the ship at different positions, as well as from instruments that are stationary on the seafloor and have been so for several years. Measurements from the ship are done with a CTD measuring Conductivity(=Salinity),Temperature & Depth, which is lowered with a crane from the deck. Furthermore there is a ship mounted ADCP (Acoustic Current Doppler Profiler) which continuously measures current speeds. 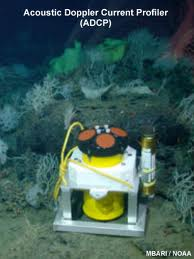 The stationary instruments rigs at the seafloor consist of an ADCP at the bottom and several Microcats (mini CTD:s) at various depths. They are held in place with a big weight at the bottom and a buoy on top and have GPS transponders so we can find them. Sketch of bottom mounted rig. If we manage to find them and get them clear of ice, they will be winched up to the ship, batteries will be exchanged and the measurement data recovered. After service they will be put back down again and left in place until next time around. Apart from the fact that this area is one of the least measured and understood in the whole world, the main reason for us to do research in Antarctica is the fast melting of the ice. The major casue for the melting is probably ocean currents. Relatively warm deep water enters the shelf area and melts the glacial ice from below. Relatively warm here means that the deep water contains more heat than the upper layers and has potential to melt the ice. The actual temperature is between 1 and 2° C in our area. The speed at which the ice has been melting recently is quite remarkable. 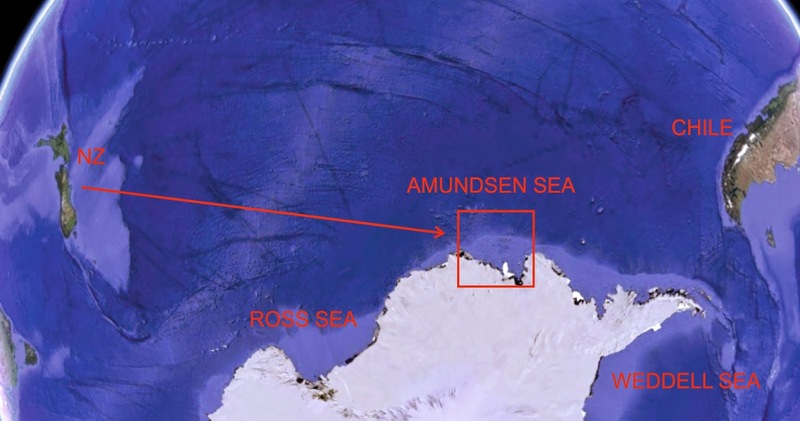 This is the fastest melting marine ice anywhere in the world. There are measurements in the area of some glaciers losing up to 9 meters of thickness per year. As of today we are not really sure why this fast melting is occurring now and if it is set to continue at the current speed or not. The deep currents themselves are influenced by winds. Local winds are in turn subject to large scale climatic oscillations such as El Niño and SAM. Our scientific aims are firstly to be able to better describe how the currents vary in time and space and secondly to do a complete heat budget for this ocean. That means to decide which processes are important in distribution of the heat and calculate how much heat is lost or gained in the parts of the whole system. The heat budget can then be used to assess future changes in this area. I am very grateful to be able to participate in this exciting project. To have marine science as an occupation is something really satisfying. This is all fine for me but why should anyone else care about Antarctica? To put it another way, why should Swedish tax money be spent on research in this far flung place? The short version to this answer is that very fast changes are occurring and we are not so sure why because this in an area with very few historic measurements. This owes much to the fact that it is a very cold and hostile zone. Most data are younger than 10 years and normally only from summer season. If we can retrieve our moorings, we will have a four year continuous time series, which is one of the longest existing in Antarctica. The Amundsen Sea is one of three drainage basins (where the ice of the glaciers flows into the ocean) for the West Antarctic Ice Sheet (WAIS), the Ross and Weddell Seas being the two others. The total volume of the Antarctic ice sheet is estimated to 25.4 million km3 of which the WAIS is approximately 10%. If the WAIS should collapse and melt, global sea levels may rise up to 3 meters. Although many of these figures are estimates, there is still reason to be concerned. Also, if we want to know how the world´s climate works, it is necessary to know about the oceans too. The Southern Ocean which surrounds Antarctica is the main source for cold and heavy deep water, which is an important driver for the global circulation of the world´s oceans. The deep water is distributed to the oceans by the strongest current in the world, the eastward flowing Antarctic Circumpolar Current. 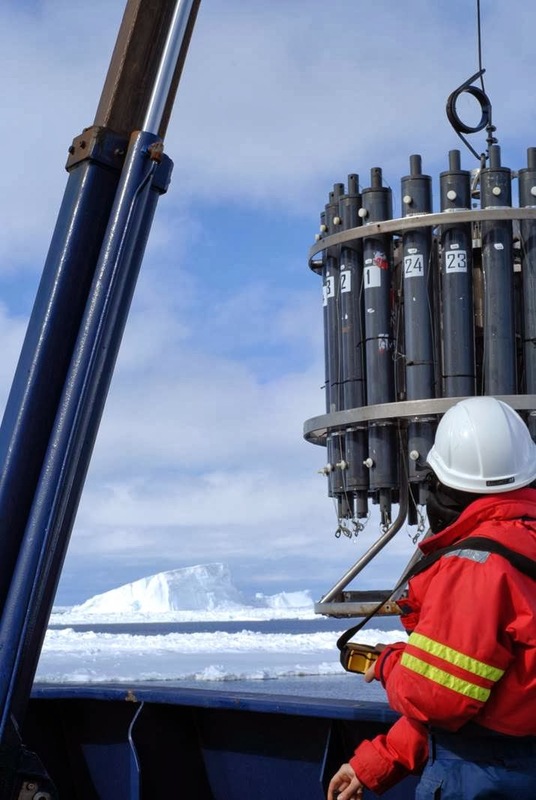 Another argument in favor of Antarctic research, perhaps less directly beneficial to society, is that of scientific curiosity. There are many unanswered questions regarding several things oceanic in this area. The great potential for discovery is in itself a good reason do to research here.